The US military and the CIA are turning a blind eye as Afghanistan’s spy agency spends foreign donor money on militias which are committing human rights abuses that help destabilise the fragile country, according to local and western officials. The Afghan national directorate of security (NDS) arms strongmen ostensibly to fight the Taliban and other militants. But some militia leaders use their new power to fight local turf wars, including against elected government officials, rather than insurgents. One such commander, Perim Qul, in the northern province of Takhar, has received about $85,000 (£70,000) to arm 500 men. However, he allegedly spends part of that money on a private prison where he beats and extorts local people. His men have even ambushed and killed a local politician. One evening in July, Perim Qul’s men detained a man named Najib as he was relaxing outside the hotel he owns. After several days’ beating, Najib said he would acquiesce to their demands for cash and asked for a phone to request the $3,000 they demanded. Instead, he called police, who rescued him. Najib sent photos of his bruised back and legs to the provincial prosecutor, and got one of his tormentors arrested. “I have no enmity with Perim Qul. I am just a simple hotel owner,” Najib said. That kind of justice, though minor, is rare in Rustaq district. 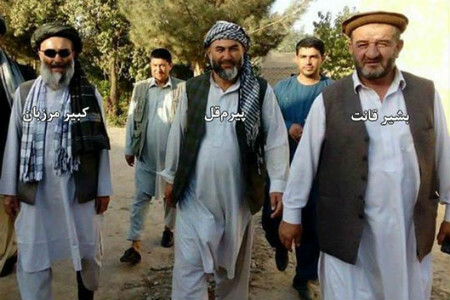 Pirum Qul (middle) with fellow criminals Kabir Marzban (left) and Bashir Qant. Qul, a 55-year-old war veteran with no official title, has been running Rustaq like a fiefdom for over a decade. Local residents say he has opposed any attempt – including by the government – to assert authority there. To pay his men, he allegedly coerces civilians. So when the Afghan government last year approved Qul’s request to enrol in its anti-Taliban militia program, many local people were concerned. Hundreds protested outside the district government building. Contemporary western security reports obtained by the Guardian warned that reinforcing Qul’s militia could add to violence, crime and territorial rivalries. Qul got money for 500 men. In reality, police officials believe, he commands up to 1,500. Meanwhile, there are only 35 national police officers to maintain security in the entire district, said Gulistan Samadi, a former district police chief. Shortly after Qul received the spy agency money, his men ambushed a vehicle carrying a local rival, the provincial council member Aynuddin Rustaqi, killed one bodyguard and abducted him. Rustaqi was eventually released, but a few months later, he was less fortunate. In April, an argument between the politician and the strongman turned violent, according to witnesses and western security analysts. After two militia members were killed, Rustaqi found himself surrounded in the local government headquarters by 200 armed men. During a more than two-hour standoff, no government forces intervened, and Rustaqi was eventually killed alongside three supporters and another person. “The government can’t stop them because they don’t have the force,” said Najib, the hotel owner. Rustaqi was a vocal critic of the government’s arming of irregular militias. His son said he was a victim of nothing more than a brutal show of force. “For 13 years Perim Qul has tried to run for provincial council, but he doesn’t have public support. 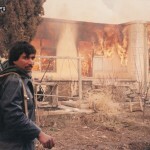 Now, he has a lot of armed men,” said Ahmad Jawad, the son. In an interview, Perim Qul admitted that his chief enemy was not the Taliban, whom he was paid to fight. It was the local governing political party. Qul said he was not out to unseat the government. “If the government provides security and asks us to put down our weapons, we will disarm,” he said. The People’s Uprising program is reminiscent of a controversial local police scheme, ALP, initially introduced by the US military to build village-level resistance to the Taliban and help foreign forces withdraw from Afghanistan. However, the ALP has been widely criticised for employing child soldiers, abusive behaviour, and creating fertile ground for armed opposition such as the Taliban. While the US does not directly support People’s Uprising groups, the militias are bankrolled by the National Directorate of Security – and the bulk of NDS funding is believed to come from the CIA. In the past, the CIA has run paramilitary Afghan units responsible for killing civilians. More recently, the Washington Post has reported that the CIA also funds and operates alongside ruthless militias in the Afghan east. A spokesman for the CIA refused to comment. The Afghan government said it worked “with a lot of precaution” when supporting People’s Uprising groups. It insisted that the program had been “effective in most of the cases”, said Haroon Chakhansuri, a presidential spokesman. The NDS officially declined to comment, but a local NDS official in Takhar province said the allegations against Perim Qul in this article were founded. While the US military said it did not fund the Afghan intelligence agency, it did support the army and police, whose jobs become more difficult when violence flares up. Yet, international forces claim to not discuss the militia program with the Afghan government. “It’s just not a topic we’re engaging the government on,” said Charles H Cleveland, the international coalition’s spokesman. “It’s a sovereign nation; they make sovereign decisions.” Cleveland did not see militia leaders like Qul undermining security. However, an informed coalition staff member said the US military was fully aware of Perim Qul’s activities but turned a blind eye, perhaps because the regular Afghan forces were stretched so thin they depended on vigilante militias. “They are not ignoring it out of ignorance. They are ignoring it with intent,” he said. The same reasoning might apply to the Afghan government, which is mired in political crisis and a long-running war. 23.12.2016: Afghanistan’s vice president is known for brutality. But he may have gone too far. General Fair Use Notice: Many reposted pages of reports from Afghanistan on this section of our site may contain copyrighted material whose use has not been specifically authorized by the copyright owner. RAWA is making these material available for non-profit purpose in an effort to raise awareness on the ongoing human rights catastrophe in Afghanistan. We believe that this constitutes a "fair use" of the copyrighted material as provided for in section 107 of the U.S. Copyright Law. If you wish to use these copyrighted material for purposes of your own that go beyond "fair use," you must obtain permission from the copyright owner.